​In 1976, Elder Evans received a bachelor of science from the University of Utah in community health education. In 1979, he received his juris doctor from Brigham Young University. His professional career involved working as an attorney and as an executive for an investment banking firm. 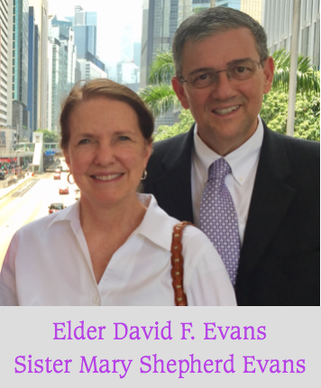 Elder Evans has served in a number of Church callings, including full-time missionary in the Japan Mission, bishop, stake president, president of the Japan Nagoya Mission (1998–2001), and counselor and President of the Asia North Area. David Frewin Evans was born in Salt Lake City, Utah, on August 11, 1951. He married Mary Dee Shepherd in January 1973. Sister Mary Shepherd Evans was born in Salt Lake City, Utah to Heber Joffre Shepherd and Edith Evans Shepherd. She grew up in the Holladay area of Salt Lake City. She graduated from the University of Utah with a Bachelor of Science degree in biology. Elder and Sister Evans met at the University of Utah where they dated for a year before he served a mission in Japan. After he returned, they married in the Salt Lake Temple. They are the parents of eight children and enjoy 25 grandchildren. Wife, mother and homemaker are Sister Evans' full-time occupations. She has been active in many aspects of her children's schools, initiating and serving in a variety of programs. She has served as Young Women president and counselor in both Primary and Relief Society presidencies. She served with her husband as he presided over the Japan Nagoya Mission from 1998 – 2001, and has continued to serve with him in the various assignments he has received, including in the Asia Area Presidency. ​Elder Randy D. Funk currently serves as president of the Asia Area. He was sustained as a General Authority Seventy of The Church of Jesus Christ of Latter-day Saints on April 6, 2013. At the time of his call he was serving as the president of the India Bangalore Mission. Elder Funk received a bachelor of arts degree in history from Utah State University and a juris doctorate degree from the University of Utah Law School. Prior to his call to full-time Church service he was a partner in the law firm of Sherman & Howard LLC in Denver, Colorado. 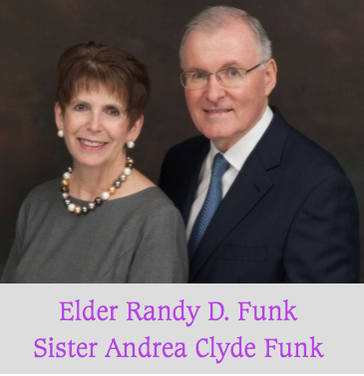 Elder Funk has served in numerous Church callings, including as a full-time missionary in Indonesia, bishop, stake president, Area Seventy, and mission president. He served on the board of directors of several community organizations including the Executive Board of the Denver Area Council of the Boy Scouts of America. Sister Andrea Clyde Funk grew up in Logan, Utah where she developed a love for the outdoors and learning. She met Elder Funk after an Institute dance at Utah State University. They were married in the Logan Temple. They are the parents of six children and the grandparents of 14 grandchildren. Sister Funk is grateful for the joy she has experienced as a full-time mother and homemaker. She enjoys reading, writing, and drawing. Sister Funk graduated from Utah State University with a degree in social work. She was active as a parent volunteer in her children’s school district and developed and provided training for parents of school age children. Sister Funk has served as a teacher and leader in the Church auxiliaries. She also served as an Institute and Seminary teacher, Primary chorister, and Interfaith Specialist on the Denver Area Public Affairs Council.